Since the original post, Cobalt Apps have migrated Dynamik, which was built on Eric Hamm’s Catalyst Theme, onto the Genesis Theme framework produced by Studiopress. 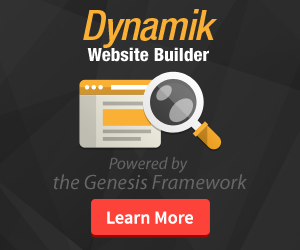 Whilst Catalyst is still supported, anyone starting out today, I recommend you invest in the Genesis framework and then either create your own WordPress theme by using Dynamik Web Builder or the Theme Extender tool, offered by Cobalt Apps. I’ve left the original post intact below. I am struggling to remember quite what got me onto using Catalyst Theme for my websites, but it’s by far the single biggest step forward I’ve taken on my web design journey. You see, I originally taught myself all I know about web design, and it all started back in 1996, when worked in a call centre over in France. One day, the guy who managed our Intranet site, and back then that was something pretty new and novel too, upped and left the firm overnight. Working in a fast-paced technology firm, the content he left behind quickly got out of date. A couple of us set about reverse-engineering what he’d put in place and soon found ourselves working with a fab little tool, AOLpress. In later years I moved onto Adobe PageMill and Microsoft FrontPage before landing on Macromedia (now Adobe) Dreamweaver. So the early years were mainly spent working with what you see is what you get (WYSIWYG) tools, but quickly I wanted to understand and fine-tune the code, so I moved into editing HTML and later a bit of PHP code and cascading style sheets (CSS). I find with Catalyst that I can focus much more of my energy on the creative process rather than getting stressed about how I’m going to be able to re-produce a certain effect that a client has seen on someone-else’s site. I really enjoy the iterative process of developing a compelling website. Whilst I may not feel all that comfortable staring at a blank sheet of paper at the beginning, once we start thinking about what we want visitors to the site to be able to do and how we want their experience to pan out, the creative juices really start flowing. Part of the appeal of using Catalyst is that it’s so flexible and gives me so many options right out of the box that I can play around with. Getting a basic site up and running takes very little time. That means we can quickly establish the basic layout, colour palette and features of the site before moving onto the more in-depth features and customisations. Here again, the advanced features of Catalyst, such as custom widget areas and custom hook boxes, together with the all-powerful cascading style sheet (CSS) builder make life really easy for the web developer. My most recent project entailed creating a members-only section of the Guildford Choral website. Cutting a long story short, we ended up using in excess of 30 different plugins for WordPress across the public and members areas of our site, including Buddypress, bbPress, s2Member and a whole load of related plugins. Working with Catalyst made our lives so much easier and it appears to be the tool of choice for developing websites for a growing number of developers – I totally understand why. Want to know more? Do you have a site you want to refresh or create? Why not drop me a line?